NASA's MODIS Adaptive Processing System (MODAPS), which is part of NASA's Goddard Terrestrial Information Systems Branch, Code 614.5, of the Hydrospheric and Biospheric Sciences Laboratory, operates the LANCE-MODIS data system. LANCE-MODIS provides certain Aqua and Terra MODIS L0, L1, L2, L2G, and L3 products on a near-real-time basis. On average, the L1 and L2 products are available within 2.5 hours of the observation time. The products are available by subscription or by direct FTP access. Whereas the standard MODIS forward processing acquires 2-hour L0 files for Aqua within 25-41 hours and for Terra within 8-40 hours of real time (driven by the availability of attitude/ephemeris and ancillary data) from NASA's EOS Data and Operations System (EDOS), LANCE-MODIS acquires session-based L0 files from EDOS and the end of the session is available within 10-30 minutes after real time. LANCE-MODIS uses the Terra attitude and ephemeris data entrained in the L0 data. However, for Aqua the attitude and ephemeris data are acquired from the EDOS rate buffer. All of the MODIS L1, L2, and L3 products generated by LANCE-MODIS have been modified to add “NRT” metadata to the filenames to enable the products to be distinguished from the MODIS standard forward-processed products. LANCE-MODIS acquires all of the ancillary products from the data suppliers. The production rules for some of the science codes have been relaxed with respect to these ancillary data to allow the data products to be generated within 3 hours of real time. LANCE-MODIS operates on a 7×24 hour basis. LANCE-MODIS has two standalone systems that use different network routes. 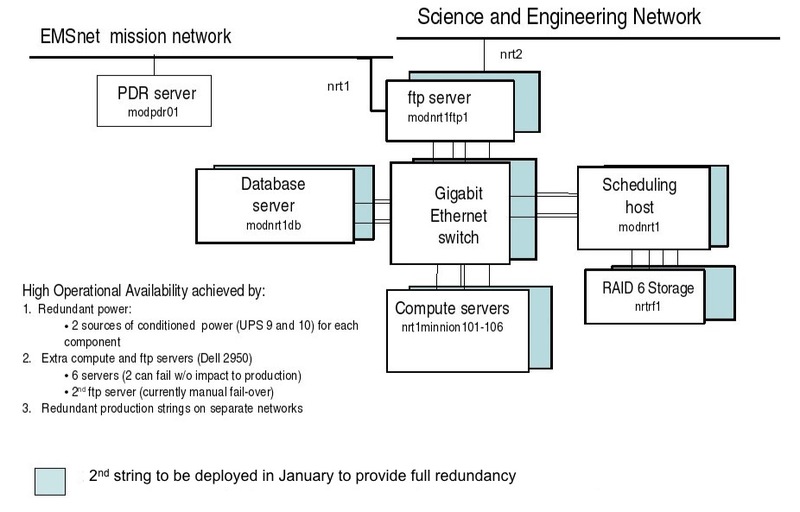 It is expected that this redundancy will reduce the system downtime to less than 1%. The simple architecture used for LANCE-MODIS is shown in the diagram above. The system includes 3TB of production disk and 5TB of archive disk on the FTP server. The latter allows the archive of approximately 5 data days of NRT data products. The system includes 6 minions used for the data production. The initial system uses the Open EBnet LAN. The second system will use the Science and Engineering Network (SEN). The data flow is shown in the diagram above. 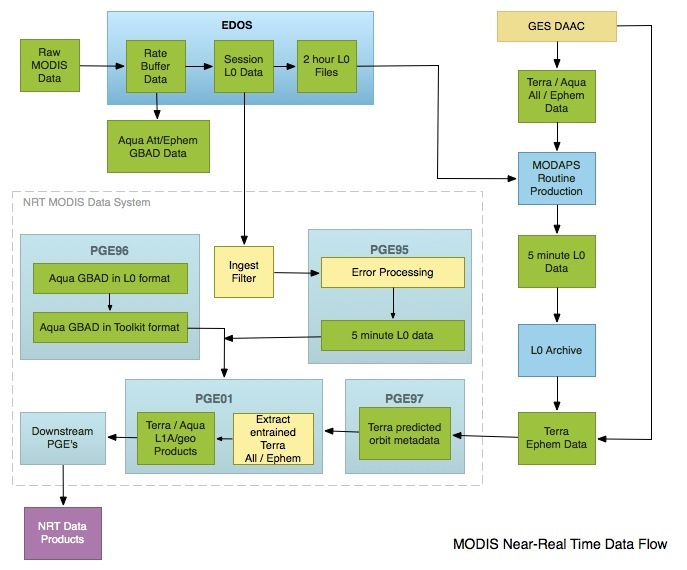 The session based L0 data for MODIS are ingested from EDOS. These are processed by PGE95 which removes duplicate packets, removes incorrectly time tagged data, and generates 5-minute L0 granules for processing by the standard PGE01 code (L1A and geolocation). The entrained attitude and ephemeris from the L0 data are used for Terra. However, a special PGE97 is required to generate the metadata needed to enable the Terra ephemeris data to be ingested by PGE01. For Aqua, the attitude and ephemeris GBAD data are ingested from the EDOS rate buffer. These are processed by PGE96 which generates, in turn, Aqua GBAD data in the L0 format and the toolkit format for PGE01. Both of these formats are archived for distribution. All EDOS data products are sent to the PDR server by EDOS and are ingested from there by LANCE-MODIS.